Lovely old charger done in sepia colors. Signed Graf and marked on the back "Der Salontirvler" with the Royal Rudolstadt mark and #7826 impressed in the center. The acorn border is decorated with raised gold. 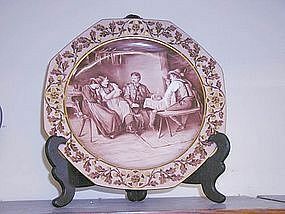 This beautiful charger is in perfect original condition and measures 14 1/2" in diameter. 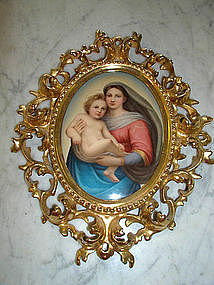 Beautiful handpainted Hutschenreuther porcelain plaque of Mary and Jesus. It is not artist signed, but has the Hutschenreuther crown and shield mark on the back and is of the highest quality. The plaque itself measures 6 5/8" x 5 1/8" and in its original frame it measures 12 1/4" x 9 1/2". It is in great original condition.